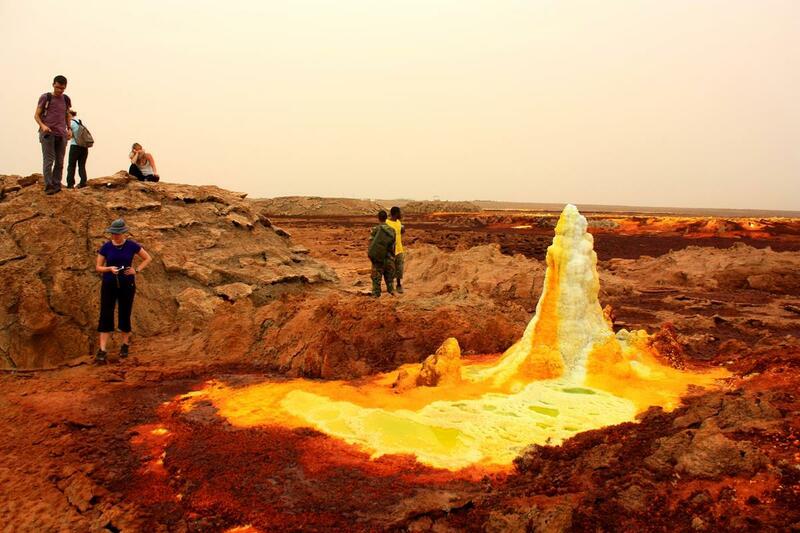 A glance at the guide book on the Danakil Depression in north eastern Ethiopia, with its tales regarding former castrations of unwelcome tourists by locals and recent killings of tourists by Eritreans, persuaded us that it would not be advisable to attempt to do this trip on our own. In addition, permits and obligatory security arrangements are complicated, involving police, army personnel and Afar tribesmen, all armed. 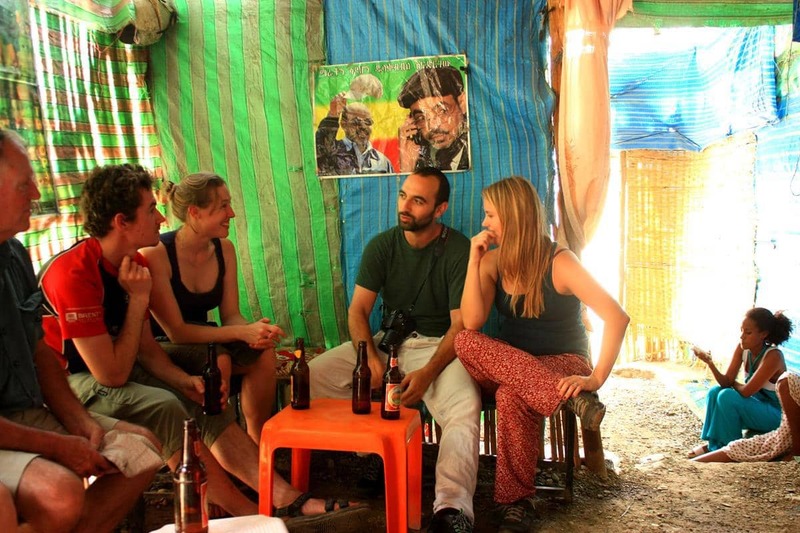 In contrast a single call to ETT Tours in Mekele got us a discounted rate to self-drive and join a tour group whose nationalities included British, German, Swiss, Korean, Spanish and American. All of them turned out to be great, as were the ETT guides and drivers! The main purpose of this four day excursion was to see the Erte Ale Volcano which last erupted in 1967, is still active and, we are told, has the world’s only permanently molten lava lake. 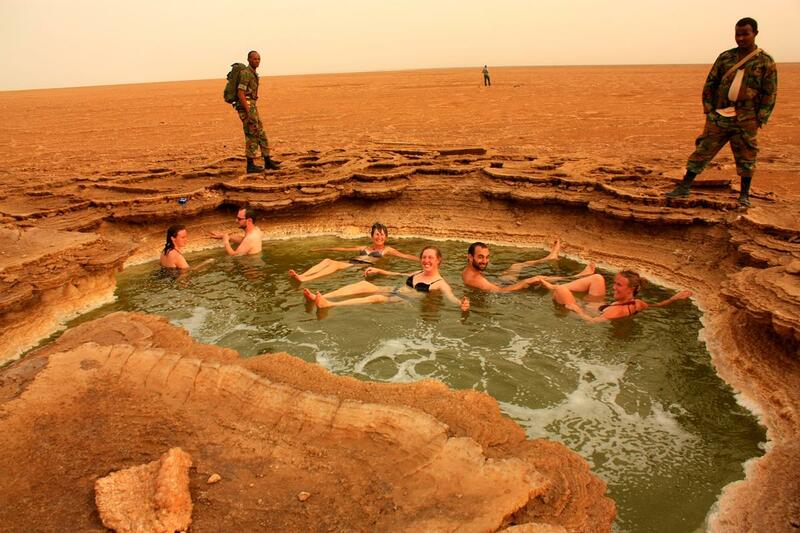 Little did we know what an extraordinary experience the whole Danakil would be. 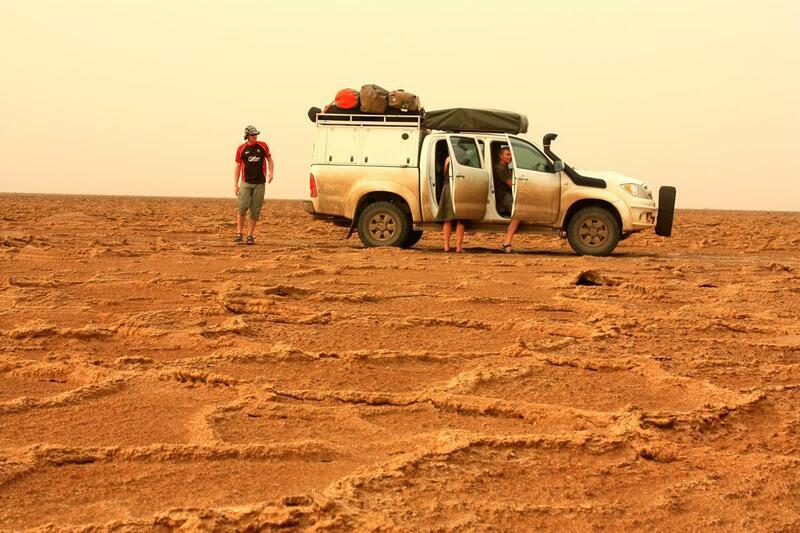 From Mekele we drove in convoy, comfortably on asphalt, into the Danakil Depression. As we switch backed down steep slopes off the high ground we were enthralled with the hilly landscape that disappeared into the haze, reminding us of the Richtersveld in South Africa. 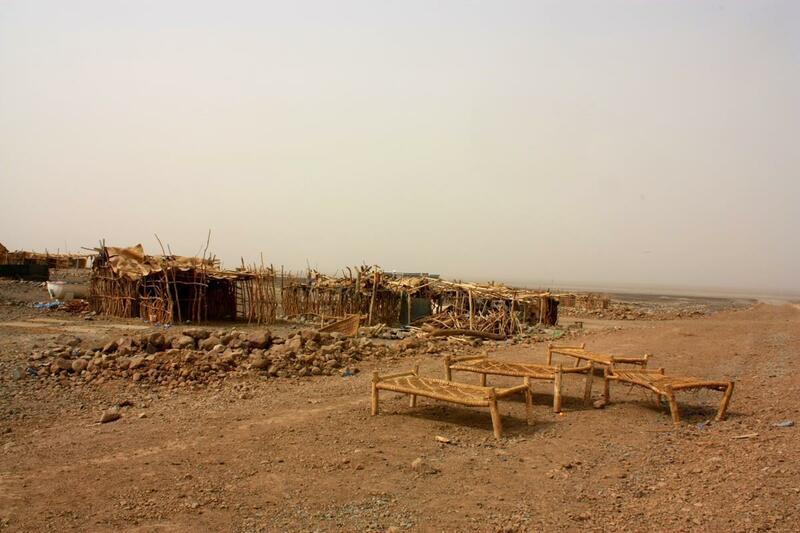 It quickly became hotter and drier and the houses now consisted of wooden shelters similar to those seen at Lake Turkana. 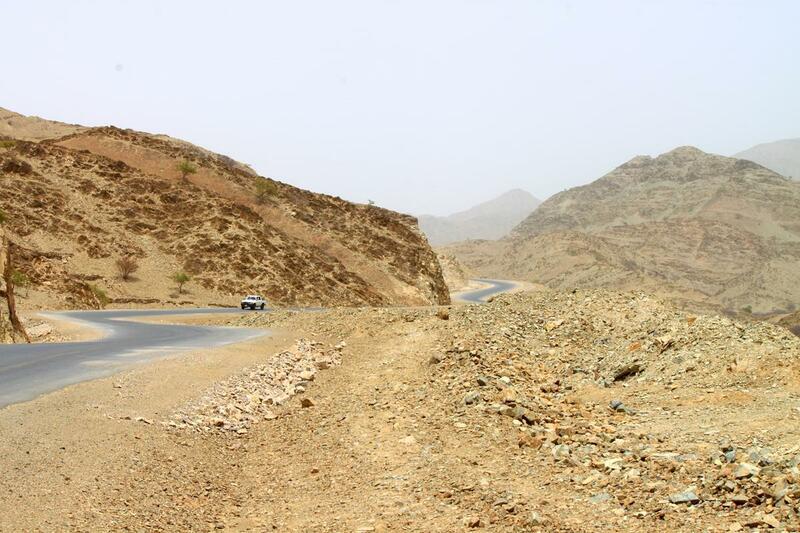 The dry landscape reminded us of the Richtersveld in South Africa. We could not believe that the Afar people actually live in such harsh conditions, the temperature having risen to 38 degrees at our lunch stop in Berhale, where we indulged in semi frozen beers. 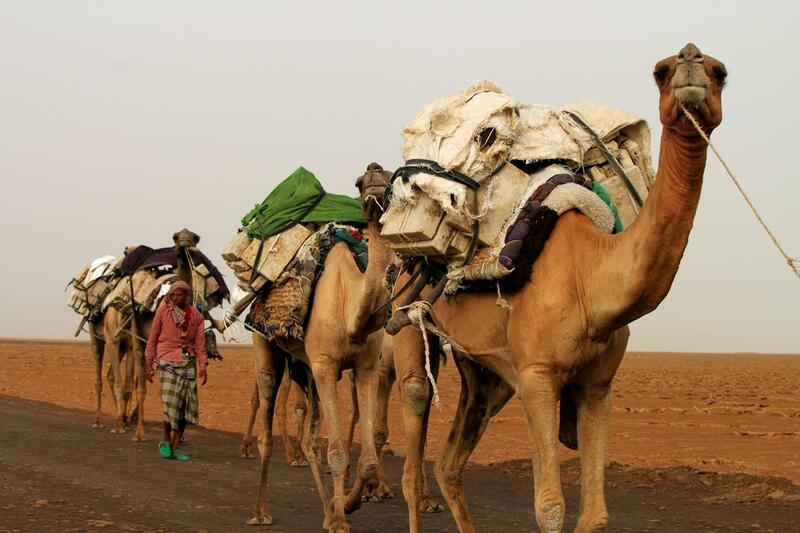 In sharp contrast, annually an estimated one million camels in caravans carry salt blocks out from the Danakil salt mines and also stop in Berhale before proceeding to the northern highlands to sell their loads. The desert-like town of Berhale. We thoroughly enjoyed the semi frozen beers! When we arrived at the Afar settlement of Hamedela, our overnight stop on the edge of the Depression, it was 43 degrees Celsius. This settlement is also the site of a potash mine for which the Israelis recently bought a 24 year concession and it’s thanks to this that the road from Mekele is tarred. There is also an army camp here, a remnant of the war with Eritrea, which provided three armed guards who escorted us into that region of the Depression. 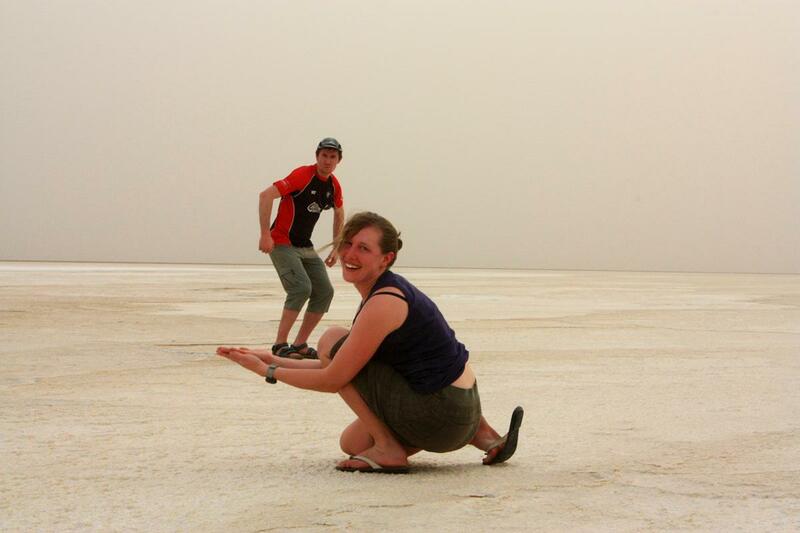 From Hamedela we left the asphalt and drove to Lake Assala, a solid salt lake in a highly active volcanic area. The road surface was now hard, damp salt, its periodic small ridges rippling our suspension as we passed. The salt formed small, hard ridges. Seismic studies indicate that this salt layer extends down 2000m. As the majority of salt mining activities had already stopped during this hot season we were lucky to meet a small caravan of camels loaded with salt blocks. 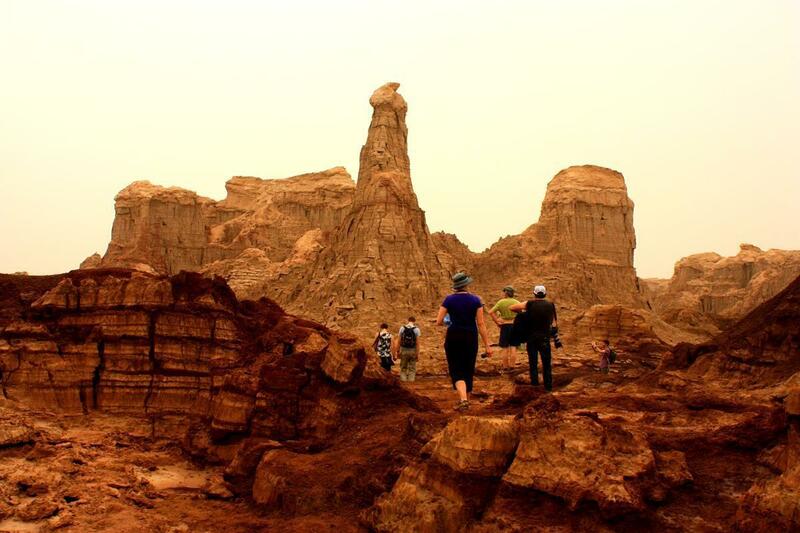 A small caravan of camels carrying salt block out of the Danakil. By now it was a 46 degrees; a lot ‘cooler’ than the 49.7 degrees experienced the week before, which was still lower than usual temperatures which often rise to the low fifties. 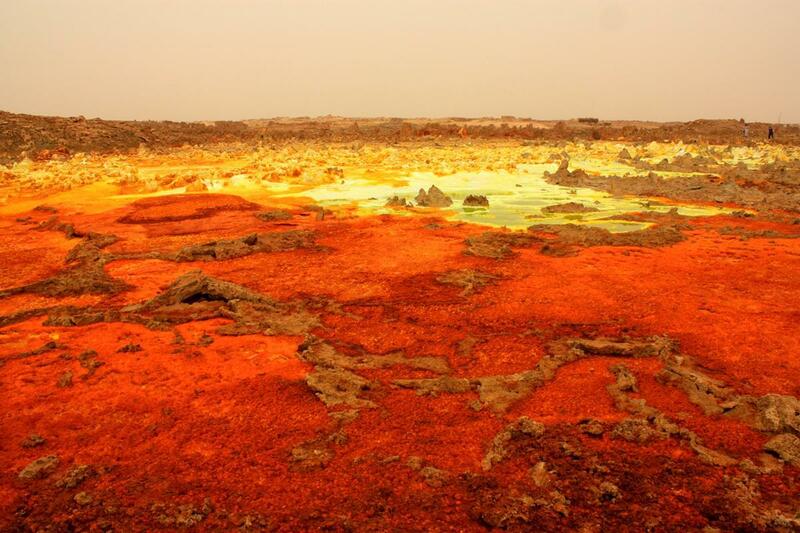 This area is known as the hottest place on earth with average temperatures of 34-35 degrees year round. To add to our discomfort a strong hot northerly wind blew in off the Red Sea. Having fun, taking optical illusion photos on Lake Assale. We stopped and walked some way to a small jacuzzi sized salt pool, its edges lined with greenish white sharp salt crystals and its salinity 37%, higher than that of the Dead Sea. Most of us could not resist a swim in the green luke warm water and enjoyed experiencing its buoyancy, floating effortlessly on our backs. Floating in a salt pool. The edges of the pool is lined with sharp salt crystals. 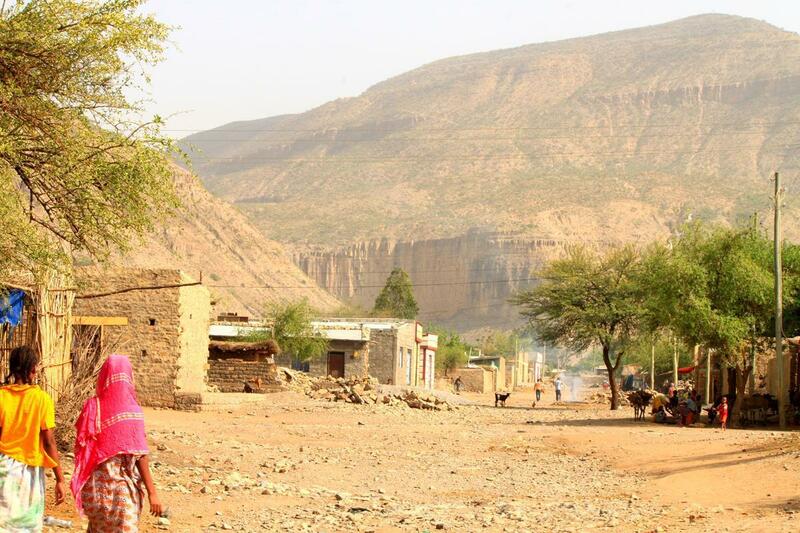 Arriving back at Hamedela we watched as rickety wooden framed beds strung with natural fibre were carried out of local dwellings and placed on the dusty, rocky ground close to the wooden ‘kitchen’ structure. We slept in the open on rickety wooden framed beds. With no facilities at all, the thermometer at 37 degrees and the wind still baking, we knew we were in for a hot, uncomfortable night; and so it proved with the mercury still at 35 degrees early the next morning. No one rested well. After breakfast we drove to the Ragad salt mines, once again with three armed escorts from the army camp. 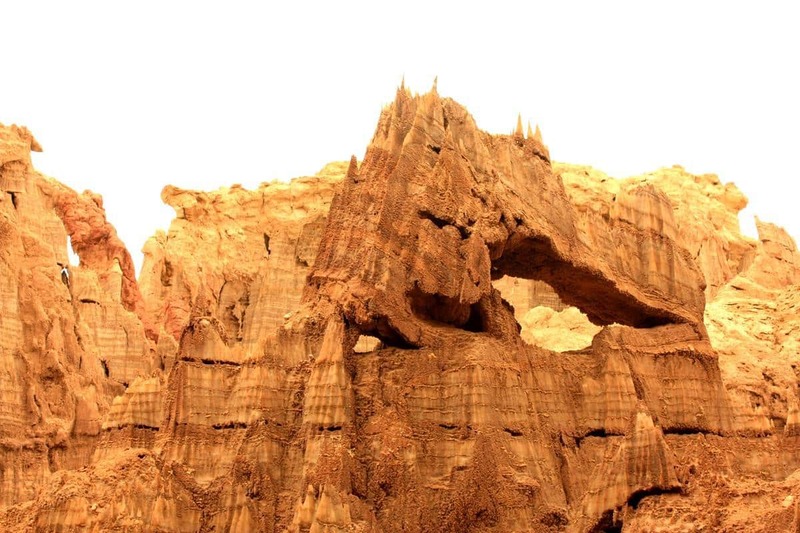 The Afar and Tigray people have worked here for centuries and still today specific jobs are reserved for each tribe, one being permitted to lever the thick salt slabs off their base and the other to shape it into rectangular blocks, destined mainly for use as animal salt licks. 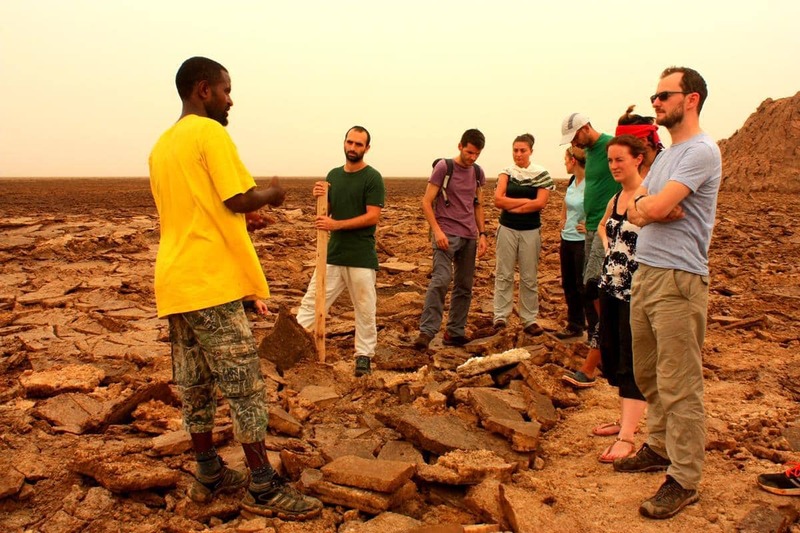 Our guide explains how salt is mined in the Danakil. 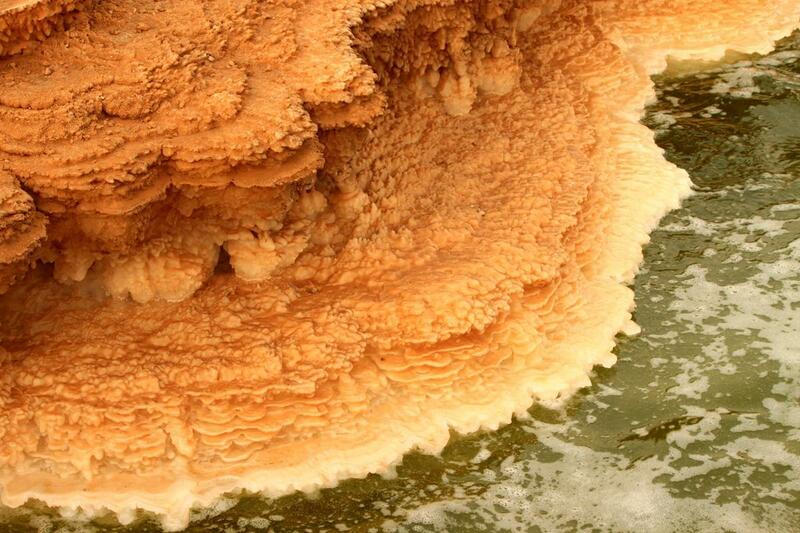 Next we headed for the surreal landscape of Dallol, which at -116m below sea level is the 4th lowest place on Earth. 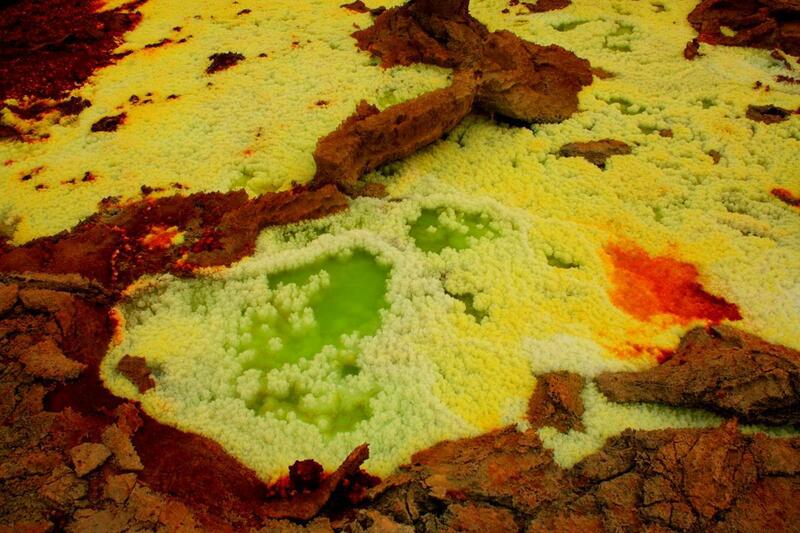 Mushroom shaped salt rocks surrounded a salt lake bubbling with sulphurous gases; the volcanic activity giving rise to strangely shaped excrescences, coloured with a combination of bright and earthy hues, some of which burbled out spurts of fluid. Reds, greens, oranges, browns and blues are derived from the predominant mineral present. 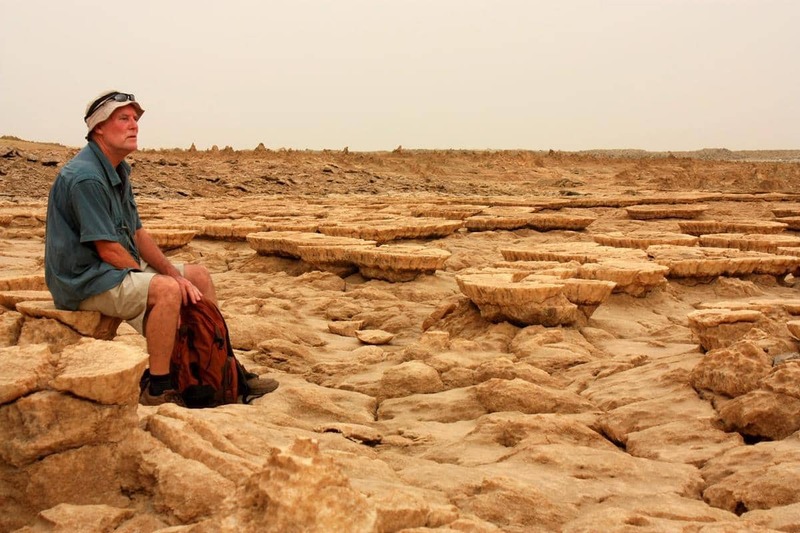 One of our party members taking a breath on mushroom shaped rocks before we reach the sulfur lake. A peak with an array of colours is formed by minerals burbling from below. 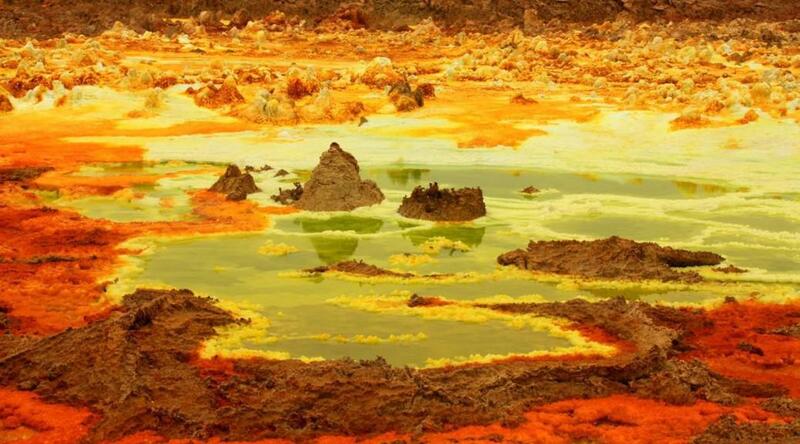 The sulfur lake has beautiful, bright colours. The different colours are derived from different minerals. Close-by is a salt mountain with huge, hard salt crystals around 30m high, enclosing caves, walkways and all manner of angular shapes, many razor sharp. Some of the salt crystals are razor sharp. Returning we paused at a large sulfur hot spring bubbling with orange gases with quite a number of dead birds around it. Stopping by a sulfur hot spring. With the high temperatures we drank about four to five litres of water daily, most of that cooling our bodies as it exited through our sweat pores. Driving out of the Depression back towards Mekele, we overnighted in a guest house in an Afar home in Abaala, otherwise known by its Tigray name, Shiket. The facilities were very basic but we enjoyed several strong cups of local coffee and a delicious traditional Ethiopian dinner. 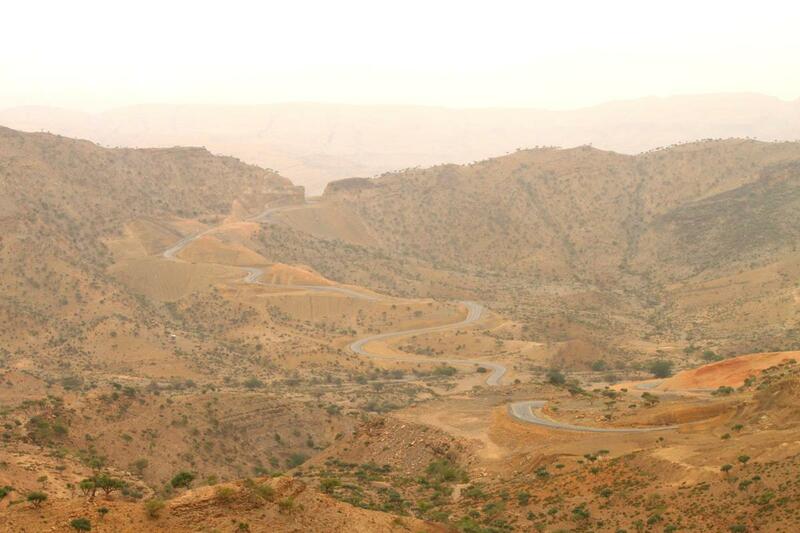 A beautiful pass on the way to Abaala. Abaala, the Afar town where we stayed over. 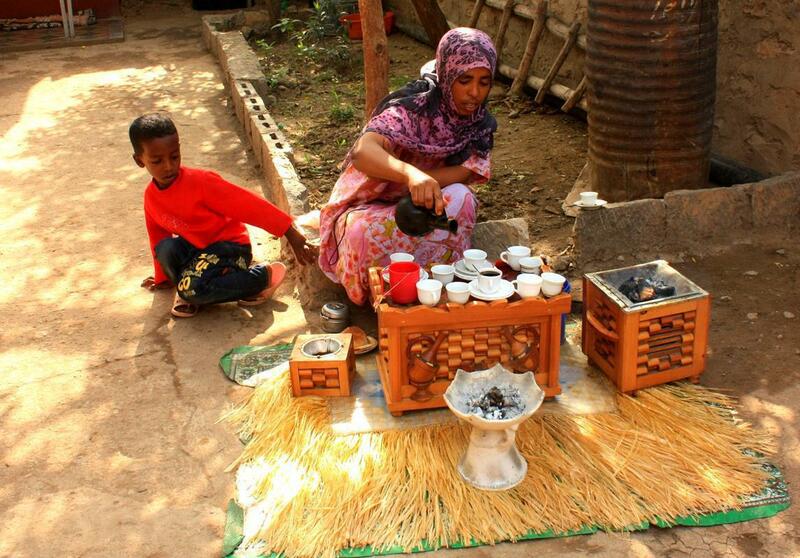 In Ethiopia you don’t drink coffee, you enjoy a coffee ceremony. Jou fotos is fantasties en het my asem weggeslaan. Jou skryfstyl laat my deel voel van die reis in laat my opgewonde wag vir die volgende aflewering. Dankie vir die deel. Ek hoop van harte hierdie word uiteindelik ‘n boek want ek sal heel eerste een koop. 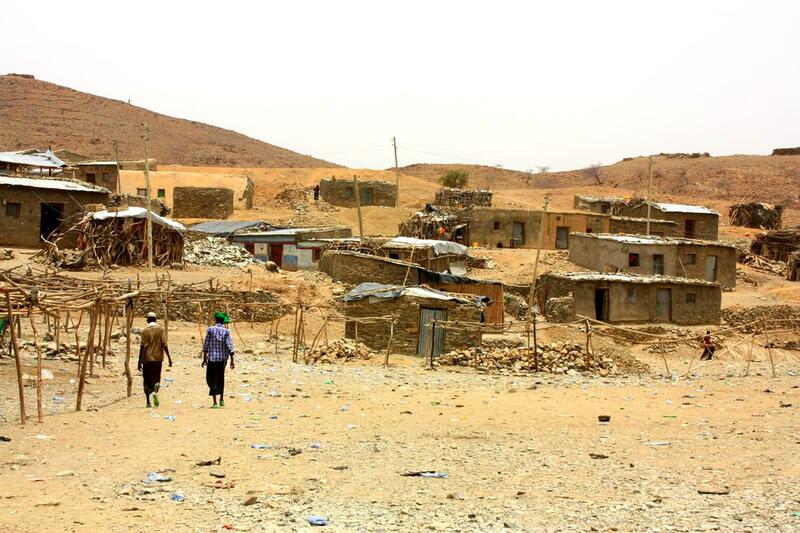 Pas julleself op en geniet elke oomblik..
Great report and photo’s of a bizarre area. My admiration. Wat n voorreg om so saam met jou te reis na die onwerklike plek. ek geniet dit so om so in die gees alles te ervaar. I am so glad you managed to get here. This is one of the places Isla and I missed out on during our trip as it was unsafe at the time. Dit is baie mooi, ons voel die hitte. Did you manage to bring your own car through the border or did you hire one? I’ve heard it’s become quite difficult to get a visa to enter overland.